This activity also gauges individual students’ understanding of the lesson or a particular focus skill. 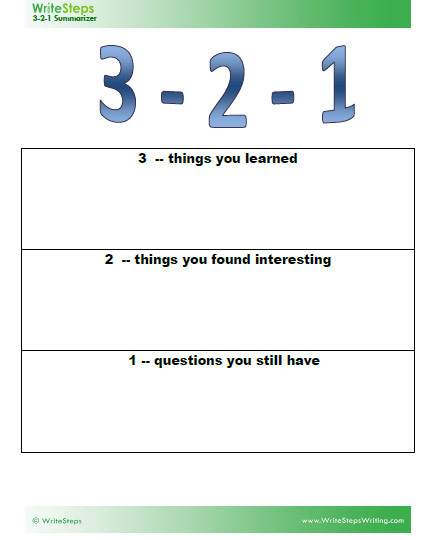 Give each student an index card or ½ sheet of paper, or use our 3-2-1 summarizer sheet. Ask students to write 3 things they learned. Ask students to write 2 things they found interesting. Ask students to write 1 question they still have about the lesson or topic. Use the fishbowl activity to evaluate your classroom’s understanding of the lesson and find out what further explanation is needed. Once completed, all papers go back in the container. Pull as many index cards as time permits. Read the question and answer. Students respond with a thumbs up or down. Have your class decide on the correct answer and tell them if a correct answer isn’t on the card. This activity evaluates students’ (individuals and whole group) understanding of the lesson and also helps you discover what further explanation is needed. Think – tell students to ponder a question or look for an example of a given skill in their writing. Pair students up – students discuss their answer or share their writing.During this step students may wish to revise or alter their original idea or revise their writing with the skill in mind. Share – a few students are called upon to share with the rest of the class. Use this activity for any number of skill checks and to assess individual students’ understanding of the lesson or a particular focus skill. For example, tell students a simple sentence to write on their boards, e.g. “The children run.